Yeah, I know it's the movie, not the book. But it's very clear, that there was left out too many things and important stuff. It was a good movie. Much better than the Half-Blood Prince. Some camera works are questionable though. These "live-action" camera isn't for the cinemas. Wobbling and lagging is for YouTube-Videos, but shouldn't be showed in a cinema. The music is good, but can't reach the Level of the first 3 movies. The dancing scene from Harry and Hermione is ridiculous with that kind of music and looks like it was made to make some money with the Soundtrack or a Single-CD. I don't want to spoil the book if you didn't read it by now, but there is so much more that was dramatically different. And even more things which has been left out. Partly because the previous movies missed to introduce things or persons, and partly it seems that they just didn't care about certain, important things. That leads to strange appearances. Like when Hermoine saw a sign in the"Tales of Beedle the Bard" and wondered why this is in a book for children. I could go on for pages. So all in all it's a good movie. I like it, and I will certainly see it again. But it's not the real Harry Potter. The characters you saw on the big screen are not the real characters from the books anymore. You do not understand why and what they are doing in the movie if you haven't read the book. 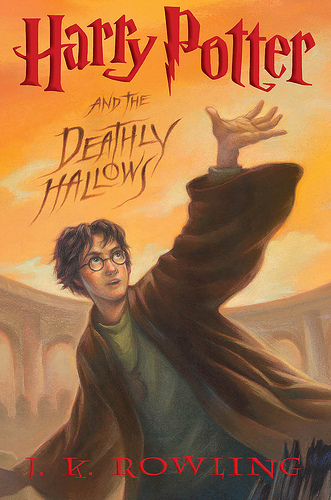 Do yourself a favor and read all of the books before you look at "HP and the deathly Hallows part II". Then you will know what's really going on. But don't read "The Deathy Hallows" without reading the previous books. From the 4rd movie on, there was left out so much, you won't even understand the 7th book anymore. You won't regret it. It gives you the magic you need to understand the movie for real.